One of the best features about the Moto X(s goog) is the ability to customize the phone’s design exactly to your liking via the Moto Maker website. 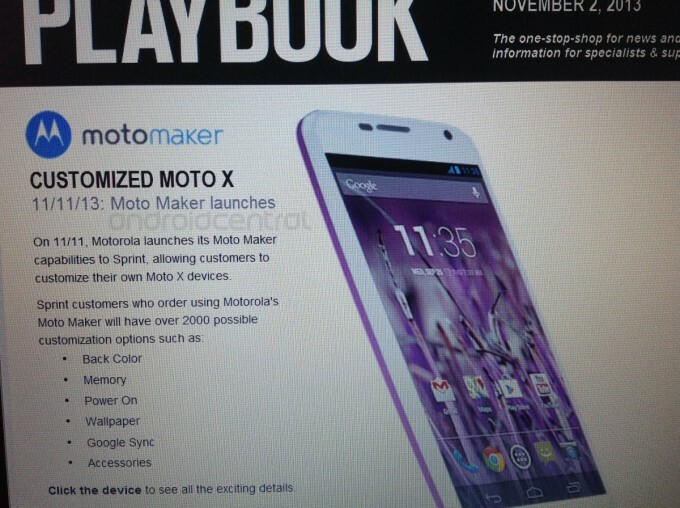 But since the phone’s release, Moto Maker has only been available to AT&T(s t) customers – until now, it seems. Android Central got its hands on a leaked document that shows Moto Maker will likely be opening to Sprint(s s) customers on November 11. Like it does for AT&T, Moto Maker would allow Sprint users to customize their phone in over 2,000 potential combinations, with the ability to choose your phone’s back, front and accent colors. Until now, customers only had the choice between black or white. There’s still no word on when Moto Maker will make its way to T-Mobile(s tmus) or Verizon(s vz), or when we’ll see the cool wooden back cover options Motorola showed off when it first introduced the phone. But at least you’ll be able to score it for half the price it cost when it came out, as Motorola recently cut the phone’s price in half to $99.99 on contract.